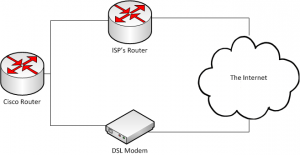 In essence, the Cisco router is connected via a leased line directly to the ISP’s off site router. 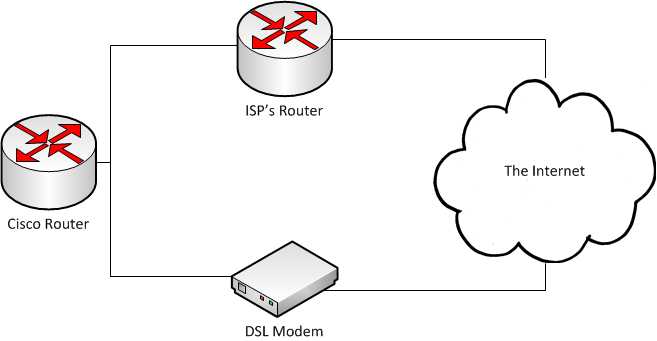 The Cisco router can also be connected to the Internet, via an on site DSL modem, as a backup. This tutorial assumes that you already have your interfaces configured and it is possible for the router to ping both your primary and backup gateways. This adds a tracked route with a metric of 1 and an additional route with a metric of 254. The routing table will use the route with the lowest metric by default (i.e. the primary). Next, add an ip sla entry to monitor the connection. This will ping a given IP address every 10 seconds. I recommend using the IP address of the next hop (i.e. “ISP’s Router” in the above diagram) as this monitor IP, providing it accepts pings. In this example, we’ll use 50.50.50.50. The 123 is just a numerical identifier for the SLA. This can be whatever you want, within the allowed range. Now, add an sla schedule so that your sla starts now and runs forever. This will show you the “Number of successes” and “Number of failures” the sla had. It should be your primary gateway. Disrupt the primary connection such that it is unable to reach the monitor IP address. Within 10 seconds, the gateway of last resort as shown by the above command will have changed to your backup gateway. Reconnect the primary connection and it will have switched back again. I have a question concerning the “Cisco Router” (refer to your figure) is it possible to use a layer 3 switch instead of this router? It is very good explanation. Thank you sir ………. Please it’s an urgent matter. I start the purchase procedure of the layer 3 cisco switch, did you have an idea with the CLI command of the SF300 switch? Hello, I would like to help me with something. I would like to do failover on my cisco router like you did. but the problem is that i have two isp but one of them is DSL. I meam that It learns gateway for dhcp an this is my main gateway. I tried to do the same thing but I can´t put track in this ip route 0.0.0.0 0.0.0.0 dhcp.. I also use “ip dhcp-client default-route 25” but It didn´t work..